Official TWRP App is the official app developed by Team Win, that lets you make sure you stay up to date with the new versions of your personalized ROM. In order to install it directly from the app, however, you need to have root privileges. The app is pretty simple to use thanks to its clean interface but it’s not recommended to ‘play around’ with it if you’re not exactly sure what you’re doing, since you could seriously harm your device. At any rate, the app tells you this itself the first time you open it. Official TWRP App makes it significantly easier to install a recovery on your Android. You just have to search for your device on the list, download it, and install it. The whole process takes only a few minutes to complete. We recommend downloading the app from the Play Store. When you first open the app, you will be greeted by a few options. First, you will need to agree not to hold us responsible for anything that happens to your device while using the app. You may also grant the app root permissions. The app will work without root, but some functionality like image flashing will be disabled. Lastly, you can opt into enabling InsightCore (more on this feature later). Once you have passed this initial screen, you will be greeted with the app home screen where you can choose TWRP FLASH or NETWORK STATISTICS (more on the network statistics later). On the TWRP FLASH screen you will need to select a device. Once you have selected a device, the app will periodically check for new TWRP versions for the device that you have selected. The default interval is once per day, but you can tap on the settings icon in the upper-right to change the interval or disable the update check entirely. If you enabled root access, you will see options for selecting an image and buttons for flashing the selected image to boot or recovery. Note that you should flash TWRP images to recovery. The boot image flashing is for flashing full boot images (not just kernel zImages) and should not be used for flashing TWRP.What is InsightCore or Network Statics? The team behind TWRP has released version 3.0.0 (3.0.0-0) of the popular custom recovery for Android devices. 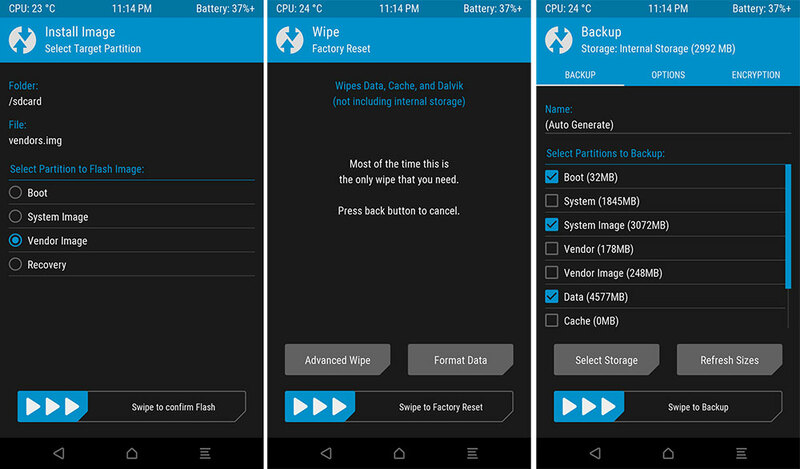 TWRP is the to-go custom recovery for many Android fanatics who flash custom ROMs and kernels on a daily basis, for fun or for other reasons. The latest version of the recovery was 2.8.2 before being replaced with version 3.0.0. This version brings many goodies. Those who use TWRP to flash files once in a while won’t be interested, but those who frequently flash files will certainly like the new features. Version 3.0.0 of TWRP is the first release in a long time, since version 2.8.2 has been around for quite a while now. The user interface has been changed. Version 3.0.0 includes a completely new theme which is more modern and much nicer looking. There is a true Terminal Emulator with arrow keys, tab and tab completion and language translation. You can flash sparse images on certain devices. There is added support for adopted storage on a few devices and the AOSP base has been updated to Android 6.0 Marshmallow. The list goes on with a long list of minor fixes and tweaks which users will not notice. TWRP 3.0.0.0 is available for all supported devices. Some of the most popular devices include Galaxy S3, S4, S5, S6, Note 2, Note 3, Note 4, Note 5, HTC One, M8, M9, Nexus 5, Nexus 6, Nexus 5X & 6P, LG flagships and so on. The installation process changes for different Android phones. If you have an older version of TWRP or any other recovery, you can flash the new version and it will overwrite it. If you have root you can use the TWRP Manager app from the Play Store to install the recovery. Alternatively, you can install the .img file where every phone has a different installation process. Go to the download link above, select your phone and download the right version of TWRP. This is the first update of the recovery after a long time, so things might not go completely smooth on the first try.